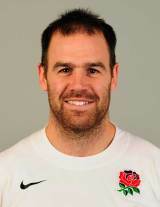 Fly-half Charlie Hodgson is the Premiership's record points scorer and has also experienced success on the international circuit with England. He made his debut for Sale against Auch in 2000, with his strong kicking game and reliable accuracy gaining him a first England cap in 2001. Against Romania at Twickenham he collected a massive 44-point haul, including two tries, on debut as England racked up 134 unanswered points. Hodgson played three games during the 2003 Six Nations as England won a Grand Slam, but did not make the trip to the Rugby World Cup later in the year. Following England's triumph Hodgson entered his most regular period at international level, when he was handed the huge task of deputising for the injured Jonny Wilkinson. In 2006, Hodgson won the Premiership with Sale - his record at club level is impeccable but he at times hit a wall at international level. His cap against South Africa at Twickenham proved to be his last until March 2008. In June 2008 Hodgson was handed the England fly-half jersey for a Test against the All Blacks and was given a torrid time by giant centre Ma'a Nonu. He disappeared from the England setup but continued to produce the goods in the colours of Sale. Hodgson continued to perform well for a struggling Sale Sharks side and he was rewarded with a return to the international arena in the summer of 2010 when he played for England against the Barbarians. He was selected for England's tour of Australia and played against the Australia Barbarians but failed to make the Test team. In January 2011 Hodgson confirmed that he would be leaving Sale to join Saracens at the end of the season. He was subsequently included in England's squad for the Six Nations. He performed well for Sarries and was rewarded with a call up from Stuart Lancaster for the 2012 Six Nations. And Hodgson's second coming on the international stage was marked with the match-winning try against Scotland in the opening round of the tournament. The Sarries fly-half charged down fellow fly-half Dan Parks attempted clearance kick and dotted the ball down for the only score of the match as England ran out 13-6 winners. Hodgson continued in a similar vein against Italy the following week as once again he charged down a kick and scored England's sole try. But despite his two-try heroics, he lost his fly-half berth for the rest of the Six Nations to Owen Farrell. After impressnig on the domestic stage near the end of the Premieship, he was called up by England for the summer tour to South Africa. After playing in both of their midweek tour matches, Hodgson announced his retirement from international rugby soon after they returned.